Are you honest with your customers? Really? Saturday was met with a cool chilling breeze. The mind doesn’t always comprehend things properly mere moments after lifting from a deep slumber. It was February and the furnace was broken. My first move was to play the part of furnace repairman. This consisted of turning a couple of switches on and off, a breaker back and forth, removal of the furnace panel door, a look inside to a collection of wires and switches and a motor, re-installation of said panel door and a call to furnace repair weekend helpline. The guy on the line was friendly, he told me that service calls on Saturdays were $150/hour plus parts but if I could wait until Monday that drops down to a paltry $98/hour. He gave me a couple of things to try, none worked so a Monday appointment was booked. He arrived Monday to discover a doohickey needed replacing and the thingamajig on the other thing was corroded. The furnace was fixed, that is all I cared about. He then disappeared outside into his truck to calculate the bill. Fifteen minutes later he came back and the amount at the bottom of the page was $212.82 which included one hour fifteen minutes labor, $80 in parts, and tax. Hang on, one hour and fifteen minutes?!? I paid $98/hour from the second he left his last repair to the moment he handed me the bill. Yes, that’s $98/hour to have him sit in his truck and tally the damage. That’s ninety-eight bucks an hour for him to drive from his last repair, grab a coffee or lunch or something on his way and then fix my furnace. And the kicker, I have no way of proving how long it took him between stops so I pay some imaginary trip fee. Not the point, it's a rip off. This is clearly a company policy they don’t go out of their way to state ahead of time. My mechanic charges less per hour and doesn't ding me for his trip to work as well. I'm happy my furnace is working but I just spent about a hundred bucks for him to sit in his truck. That’s quite a scam! In the case of doctors, dentists and I guess furnace repairmen; there isn’t much choice in the service charges you have to pay. Companies are doing this every single minute of every single day, but perhaps that is how you can differentiate yourself? Actually be honest with your customers, actually be accountable and actually deliver great service to them. It may be worth a shot. Ask a lot of questions and run the other way if it feels like a scam. We all want great service, but few of us expect it. And even fewer of us do anything about bad service. 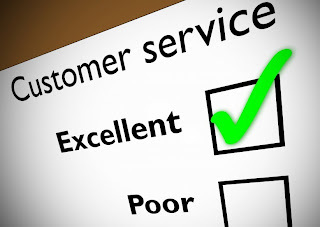 As a customer, how important is customer service to you? As a provider, how important is it to your customers?